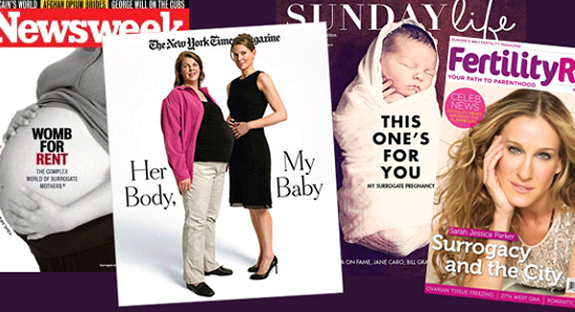 Catholic teaching on surrogacy is receiving reinforcement from current research. Some women cannot get pregnant. They’re either born without a uterus, or have a non-functioning uterus, or have been repeatedly unsuccessful at gestating an in-vitro-fertilized (IVF) baby. Many of these sterile women, invoking the principle of patient autonomy, deem a contractual agreement with a surrogate carrier as their only alternative, other than adoption. Traditional surrogacy involves a contractual arrangement between an adult female of normal reproductive health and parents intending to have a baby. For a set fee, the woman agrees (1) to be impregnated, via artificial insemination, with the intending father’s sperm; (2) to act as the surrogate carrier who gestates the resulting baby for nine months and, at birth, (3) to release the baby to the intending or sociological parents so they can raise the child. Children born of traditional surrogacy, then, share both a gestational and genetic link to their surrogate, rather than their sociological, mother. Gestational surrogacy begins with (1) in vitro fertilization of the intending mother’s egg with the intending father’s sperm and concludes, by contractual agreement, with (2) the transfer of the IVF embryo to the surrogate mother’s womb (3) so she can gestate the baby for nine months and then, at birth, (4) release the child to the intending or sociological parents. Children born of gestational surrogacy share a gestational link to their surrogate mother and a genetic link to their sociological mother. Despite the fact that statistics on prevalence of surrogacy are sketchy at best, reproductive data do reveal that, in general, surrogacy in America has grown at an even greater rate than assisted reproductive technology. In the infancy years of surrogacy—between 1976 and 1988—roughly 600 surrogate children were born in the United States. Fast forward 30 years and—voila!—a virtual surrogacy market explosion, with the US gestational surrogate birth rates nearly doubling between 2004 and 2008, producing a total of 5,238 babies. The child has the right to be conceived, carried in the womb, brought into the world and brought up within marriage. The Church not only succinctly defines the gestational link—created in the conception-gestation-birthing of a baby—but clarifies the important truth that respect for this bio-psychic bond is so essential to upholding the dignity of the human being, to promoting his continued welfare and normal human development, that experience of it constitutes a child’s natural human right and, by implication, the lack of experiencing the gestational link results in the failure to satisfy one of the child’s basic human needs. The new field of prenatal psychology helps to reinforce the Church’s moral assessment of surrogacy. Its research findings underscore just how serious the harm can be when an infant’s right to his gestational link is denied. Case in point: recent studies conducted by Dr. Susan Golombok. One of her (2013) research projects examined 30 surrogate families, 31 egg donation families, 35 donor insemination families, and 53 natural conception families. Children’s adjustment levels were assessed at ages 3, 7, and 10 using the Strengths and Difficulties Questionnaire administered to the mother and to the child’s teacher. Two of this study’s findings are germane to our discussion. First, at age 7, surrogate children in the study exhibited higher levels of adjustment difficulties than same-aged children who were conceived by gamete donation (and lacked a genetic link to their sociological parent/s). This outcome suggests that absence of a gestational connection may place surrogate children at greater psychological risk than their non-surrogate counterparts. Golombok and her colleagues noted that the increased adjustment difficulties they witnessed could well have been exacerbated by the extenuating circumstances of some surrogate families. The surrogate child is not only born to a third “parent,” but the surrogate mother, particularly if she is also the child’s genetic mother, may remain in contact with the family, thus undermining family relationships as the surrogate child matures. Another Golombok study (2011) revealed that the absence of a 7-year-old child’s genetic or gestational link to his sociological mother caused the mother’s interaction with her surrogate child (and vice versa) to be less warm and less mutually responsive and cooperative. All of this essential maternal-child melding and mother-to-baby recognition is proactively disrupted when the surrogate mother hands her baby over to its sociological parents. We can only guess how long the resulting love-vacuum is felt, consciously by the surrogate mother and subconsciously by the baby. Nor can we know when failure to experience this gestational link might morph into a panoply of insecure behavior on the part of the surrogate child/adolescent/adult: anti-socialism, aggression, difficulty forming lasting bonds with a mate, mental illness, and poor handling of stress. Put simply, the Church insists that the woman’s choice of surrogacy serves neither her own good nor the good of others. And, in saying that, isn’t the Church implying the decision and choice to gestate another couple’s child is not only a self-inflicted injustice—a failure of the surrogate to give due respect to her own personal integrity, freedom, and dignity—but also a society-inflicted injustice, a failure by the intending couple and the reproductive medical community at-large to treat the surrogate justly? Again we turn to medical/scientific research to put a fine point on the depth of the injustices befalling a surrogate mother. First, her health risks. While investigation into the physical/mental health effects of surrogate motherhood is almost nonexistent, researchers can extrapolate from the potential risks associated with artificial insemination, IVF, and pregnancy generally. The woman’s medical preparation for traditional surrogacy involves submitting herself to the pre-pregnancy risks of artificial insemination: sexually transmitted infection from the intending father’s sperm; ovarian hyperstimulation that, in rare cases, can be severe and life-threatening; and a variety of physical maladies including hot flashes, abdominal pain, mood problems, and blurred vision. Since gestational surrogacy necessarily involves IVF, it carries with it all the in vitro adverse side effects—a higher risk of multiple pregnancy, increased risk of miscarriage, anemia, urinary tract infections, high blood pressure and organ damage, hemorrhage, cesarean delivery, polyhydramnios, and placental abnormalities. The risks associated with multiple embryo implantation (routinely associated with IVF) are greater when the individual bearing the risk is a hired surrogate. Typically, she lacks the knowledge and bargaining power to reduce her health risks by demanding reduction in the number of embryos implanted. The superovulation process that physiologically prepares the surrogate to gestate can also be very dangerous, with the possibility of ovarian rupture. And, then, there’s the risk for infections. Even though clinics and matching agencies screen reproductive cells for STDs and HIV, errors can be made. And, finally, a gestational surrogate is at risk from the intensive pre-pregnancy hormone treatment aimed at matching her menstrual cycle with that of the intending mother. Both traditional and gestational surrogates risk uterine cancer from the hormone estrogen and bothersome physical side effects from the hormone progesterone (bloating, irritability, and breast tenderness). Gestational surrogates risk infections and serious illnesses from antibiotics and/or anti-rejection corticosteroids. Second, surrogate mothers are at increased risk for emotional trauma and psychological burden. The inability of some surrogate mothers to relinquish their babies—to sever the gestational link between them and their newborns—has resulted in excruciating levels of anguish for the surrogate and in high-profile lawsuits on the side of the sociological parents. The presence of emotional loss, pain, and despair for the surrogate mother—which might last a lifetime—could also lead to legal/moral deadlock and more spiritual suffering. What if neither the surrogate nor the commissioning parents want the child? Should there be penalties if the agreement is not honored? What happens to the surrogacy contract when there is a fetal diagnosis of disability or disease? Would it result in the commissioning couple reneging on their end of the bargain? Or what happens when the commissioning parents want the surrogate to abort her baby, but the surrogate has strong moral objections, or the reverse? Third, surrogate women are at risk for exploitation. Reports cite that some surrogacy agencies have chosen to locate near army bases, like San Diego’s Camp Pendleton, and have advertised in military periodicals such as Military Times and Military Spouse. Anecdotal evidence shows that some military wives, especially while their husbands are deployed, seriously consider surrogacy as a second source of income. Finally, all the potential psychosomatic harms that could befall a surrogate mother point to the basic injustice inherent in her situation. The medical and parental stakeholders are not loving, but using, the surrogate woman. The reproductive medical community and the commissioning parents know full well that for the surrogate carrier to contractually agree to transfer her maternal rights does not annul but only conceals the existing parental bonds between the gestational mother and her child. So, when the commissioning parents enter into such a contract, they reduce the surrogate mother and her child to a mere means to their end of getting a baby. When the medical community facilitates this contractual agreement, they reduce the surrogate mother to a mere object, a human incubator, who can be manipulated at will. On the part of the spouses, the desire for a child is natural: it expresses the vocation to fatherhood and motherhood inscribed in conjugal love. This desire can be even stronger if the couple is affected by sterility which appears incurable. Nevertheless, marriage does not confer upon the spouses the right to have a child, but only the right to perform those natural acts which are per se ordered to procreation. A true and proper right to a child would be contrary to the child’s dignity and nature. The child is not an object to which one has a right, nor can he be considered as an object of ownership: rather, a child is a gift, “the supreme gift” and the most gratuitous gift of marriage, and is a living testimony of the mutual giving of his parents. For this reason, the child has the right, as already mentioned, to be the fruit of the specific act of the conjugal love of his parents; and he also has the right to be respected as a person from the moment of his conception. Through their decision and choice to commission a surrogate to gestate their child, the intending parents act unjustly: toward their surrogate child and its gestational mother, by suppressing some of their basic rights; toward society-at-large, by promoting the exploitative practices of the surrogacy industry; and toward themselves, by allowing themselves to miss out on the just rewards that come from being able to view their child as the completion and confirmation of their marital acts of reciprocal self-giving love. To the extent US state legislatures let the courts rule on the enforceability of surrogacy contracts, or punt on passing laws to either prohibit surrogacy completely, or to prudently regulate industry-wide dangers with a more nuanced, informed, and deliberative policymaking process; to that extent legislators heap an injustice against the basic foundations of marriage and family life, and fail to build a legally stable and morally sound society. To the extent that those who oversee the American reproductive medical community, especially the Centers for Disease Control and the Society for Assisted Reproductive Technology, fail to adequately document, or enforce documentation of, the surrogate industry’s exploitation, unsafe practices, abuse, and fraud carried out by its spectrum of “baby-making” entrepreneurs—hormone manufacturers, sperm and egg harvesters, donor banks, foreign adoption agencies, assisted reproductive technology clinics, embryo banks, legal experts, and surrogate matching agencies; to that extent these medical overseers heap an injustice against the common good by contributing to the moral attrition of American society. Golombok, Susan et al, “Children born through reproductive donation: a longitudinal study of psychological adjustment,” Journal of Child Psychology and Psychiatry 54:6(2013): 653-660. On the Today show Golombok, commenting on her reported findings, told NBC that signs of adjustment difficulties could evidence themselves in surrogate children’s behavior problems, such as aggressive or antisocial behavior, or in emotional problems such as anxiety or depression (last accessed: 6/29/2013). Both types of donor-conceived children (from egg donor or sperm donor) showed similar levels of adjustment to naturally-conceived children. So surrogate children showed increased adjustment difficulties over both donor-conceived children and naturally-conceived children. Golombok, Susan et al, “Families created through surrogacy: Mother-child relationships and children’s psychological adjustment at age 7,” Dev. Psychol. 47:6(2011):1579-1588. Findings from this study suggest that, at age 7, surrogacy children showed decreased positive mother-child interaction than children conceived naturally. The first US surrogacy arrangement made the news in 1976, and three years later, Elizabeth Kane, a married mother of three, became America’s first surrogate mother (last accessed: 7/1/2013). If, however, donor sperm rather than father’s sperm is used for the insemination process, the resulting surrogate child would share no genetic link with either his sociological mother or father. Sometimes, intending parents who resort to IVF before gestational surrogacy have defective gametes and are compelled to use healthy donor eggs and/or sperm. If donor spermatozoa were used, any resulting surrogate child would not be genetically related to the sociological father; if donor eggs were used, any surrogate child that resulted would not be related to the sociological mother either genetically or gestationally. The Centers for Disease Control and the Department of Health and Human Services report in their 2007 Assisted Reproductive Technology Success Report that 1,293 IVF cycles involved gestational surrogates, and the Society for Assisted Reproductive Technology (SART) Report for 2008 estimates that 2,502 IVF cycles were performed on gestational surrogates resulting in 987 births and 1,395 babies. Notwithstanding its monetary “popularity,” private or public reproductive agencies don’t routinely report use-frequency of, and number of births from, traditional surrogacy. And use and use-effectiveness reports on gestational surrogacy, despite some federal government oversight, are only rough approximations at best. Council for Responsible Genetics, “Surrogacy in America,” p. 6 (last accessed: 6/25/2013). Therefore John Paul II made an “appeal to the conscience of the world’s scientific authorities and in particular to doctors, that the production of human embryos be halted, taking into account that there seems to be no morally licit solution regarding the human destiny of the thousands and thousands of ‘frozen’ embryos which are and remain the subjects of essential rights and should therefore be protected by law as human persons” (CDF, Dignitatis Personae, par 19). Donum Vitae: II, A, 1, iii. Golombok et al also issued a caveat: they suspect that reproductive donation mothers, as a reaction to the stigma associated with their controversial routes to parenthood, may have under-reported their children’s difficulties, desiring to show their children in the best light possible. In other words, the researchers left certain findings—whether the lack of a genetic link could also cause bad psychological sequelae for donation children—open ended, to be validated or invalidated by subsequent studies (“Children born,” p. 658). Golombok et al, “Children born,” p. 657. Golombok et al, “Families created,” p. 9, 10. Golombok’s research projects do not study adopted children, even though the gestational and genetic link to their biological mother has also been severed. A key difference, perhaps, between the adopted and surrogate child is the adoptive parents do not deliberately choose to contract, in a utilitarian fashion, with the biological mother for the child’s gestation, as the surrogate parents do. Rather they rescue the child from a hapless situation where the biological mother either does not want the child or cannot raise the child or perhaps is raising the child poorly. Whether, or to what degree, the altruistic attitude of the adopted parents toward their adoptive child ameliorates the emotional and behavioral disturbances observed between sociological parents and their surrogate child is an interesting question. DV: II, A, 3, ii. Council for Responsible Genetics, “Surrogacy in America,” p. 17. The Baby-M and Baby Evelyn cases are two American examples. In re Baby M was a custody case that became the first American court ruling on the validity of surrogacy. William Stern and his wife, Elizabeth Stern, entered into a surrogacy agreement with Mary Beth Whitehead, whom they found through a newspaper advertisement. According to the agreement, Mary Beth Whitehead would be inseminated with William Stern’s sperm (making her a traditional, as opposed to gestational, surrogate), bring the pregnancy to term, and relinquish her parental rights in favor of William’s wife, Elizabeth. After the birth, however, Mary Beth decided to keep the child. William and Elizabeth Stern then sued to be recognized as the child’s legal parent. The New Jersey court ruled that the surrogacy contract was invalid according to public policy, recognized Mary Beth Whitehead as the child’s legal mother, and ordered the Family Court to determine whether Whitehead, as mother, or Stern, as father, should have legal custody of the infant, using the conventional ‘best interests of the child’ analysis. Stern was awarded custody, with Whitehead having visitation rights (last accessed: 6/30/2013). Matthew Tieu, “Oh Baby Baby: The Problem of Surrogacy,” Bioethics Research Notes 19(1): March, 2007, p. 2. Tieu, “Oh Baby,” p. 6. DV: II, B, 8, ii. DV: II, A, 1, ii. Sister Renée Mirkes, OSF, PhD a member of the Franciscan Sisters of Christian Charity, directs the Center for NaProEthics, the ethics division of the Pope Paul VI Institute, Omaha, NE. She received her masters degree in moral theology from the University of St. Thomas, Houston, TX (1988) and her doctorate in theological ethics from Marquette University, Milwaukee, WI (1995).